As a follow on to an earlier post, this item of loveliness is also trending due to the popularity of a TV series. Anybody heard of Downton Abbey? 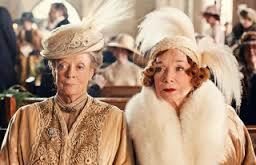 Susannah Buxton, the former fashion designer for Downton, was nominated for an Emmy for costume design. The department is now run by her former assistant, Caroline McCall. According to Buxton, Downton Abbey clothes don’t strictly adhere to the period, but use the same aesthetic while trying to make Downton style attractive to modern audiences. She says it’s more a translation than historically accurate. Ralph Lauren’s Fall 2012 show opened with the theme song of Downton Abbey. Models wore skinny plaid trousers and narrow cut blazers. Lauren’s spring show was more of a flouncy pastel affair suited to garden parties and formal dinners. And of course, where Mr Lauren leads, PoshPedlar follows. The hat I offer here is more Lady Mary than Dowager Countess, it is absolutely gorgeous. 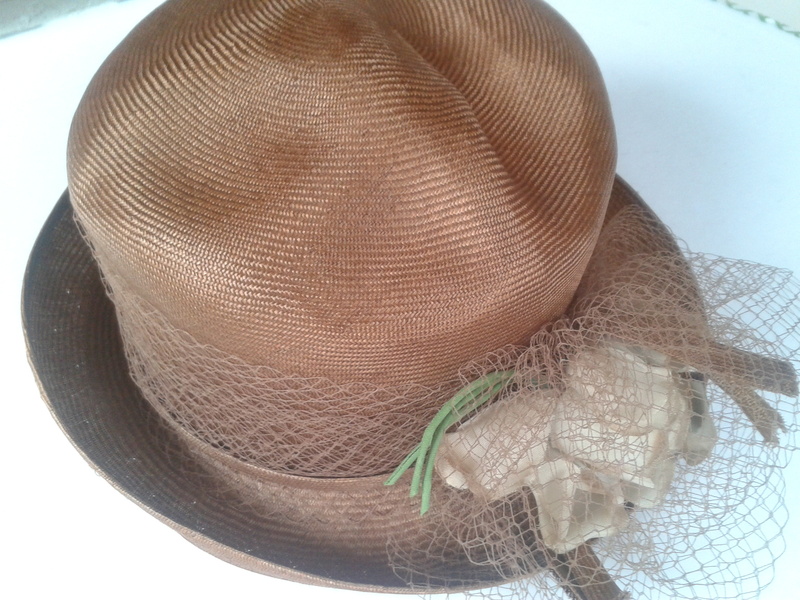 Vintage caramel straw, with a faded rose corsage and delicate net to finish. Top quality, super condition. Perfect for that summer wedding with cream trouser suit, in fact any shade of pastel will do. Each episode of Downton costs £1 million to make. You can buy PoshPedlar’s hat for a lot less here. When the first series of filming started in Bampton, Oxfordshire, the cast was doing an evening shoot ner the church, but as they were getting ready, they were watching Bampton Archery Club on one of our practice nights, seemed strange to be watched by Edwardians! How interesting, shame you weren’t called upon to be extras! It’s incredible how successful the series has been, especially across the pond. I applied to be an extra, but too late! Well that’s what I was told! I absolutely love hats! I am so glad they are making a come back. Unfortunately, I don’t look so great in hats, but I do dream of having an entire wall free so I can hang hats on it. Persevere, you’ll find a style to suit you. If the cap fits, wear it. By the way love your tweets! Came over to investigate your lovely blog after reading your comment on my jewellery journal!! Downton Abbey – well, I am a big fan of the drama of course, and the costumes, hats and jewellery all get a ridiculous amount of interest from me too.